Kleefeld on Comics: On History: Which Details Are Worth It? 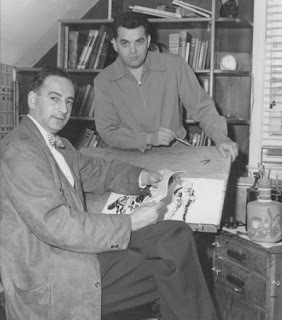 I was speaking with a comics creator this past weekend who had only "discovered" Jack Kirby a couple years ago. He said he was certainly aware of Jack's work for years, but it only really "clicked" (his word) for him a year or two ago. Perhaps not so coincidentally, he'd only been drawing comics for about five years, so his appreciation might well come from getting a more visceral understanding of the comics creation process, whereas previously, he may have been stuck on the overt aesthetics. We ended up chatting a while, and I threw out a few bits that he hadn't really been aware of. Like that Jack was writing and drawing comics professionally at age 20, doing rip-offs for the Lincoln Syndicate. And that he worked most of his career out of his home. And that he was in his 40s when started Fantastic Four and in his 50s during its peak period. None of what I said was revelatory, really. It was new to him, certainly, but that Jack lived next door to Joe Simon is an interesting anecdote but hardly changes how you view his work on Captain America Comics. How old Jack was when he worked on any given comic isn't really a huge deal, other than perhaps how it may have come before or after some other book he worked on. But, at the same time, there's a better sense of the whole picture. "Wait, Jack wasn't some crazy kid throwing wild ideas out when he created Galactus -- he was 50!" "Wait, Jack didn't go into an office every day?" "Wait, that would explain how Jack drew 8-10-12 hours a day, but still managed time for his wife and kids!" And what all that does is put your own work in perspective. Jack worked on comics for nearly a quarter century before he started getting to the stuff that he's best known for; maybe the five years you've been working isn't so bad after all. Sure, Jack had a tremendous output, but he didn't have to leave the house for 10-11 hours a day just to earn a living. That difference is bound to impact your output! Comparing your work/your success/your fame/whatever against anyone else's is something of a fool's game in the first place. After all, you're not them and have a different set of talents and goals and circumstances than they do/did. But if you want to make any sort of comparisons, even if it's for superficial purposes, it helps to have some historical context so you know what exactly you're comparing yourself against!